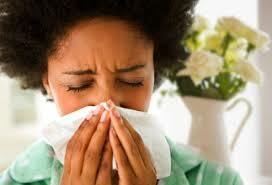 Allergens are usually substances which the body determines is a threat. Chiropractors do not treat allergies. However, we have a surprisingly large number of patients who have reported seeing a vast reduction in their allergic reactions after having undergone chiropractic care. The thought process is that the body can now operate at a higher function and allow the immune to process the allergens better. Have you ever experienced itching eyes, sneezing, an unexplained skin rash, or a running nose that seemed to come out of nowhere? These are all possible signs of an allergic reaction—and make no mistake about it, allergic reactions can be quite serious, particularly if they result in difficulty breathing or vomiting. So, what causes an allergic reaction? The human anatomy is highly complex. At its center, the element which “runs the show” so to speak, is the nervous system. It is responsible for regulating your immune, respiratory, glandular, and all other systems in your body. If you’re experiencing allergies, whether new or old, it’s possible that your nervous system is making a “false report” to the rest of your body. A chiropractic adjustment is specifically designed resolve problems within the nervous system. How much adaptation can your body withstand? Humans have the remarkable ability to adapt to many different kinds of stress, both internal and external. You’ll find examples of this throughout your life—but your body is capable of adapting too. In some cases, there are certain things that we simply can’t adapt to. If you view your capacity to adapt as a container, it’s also possible to imagine that this container might eventually become full. After a lifetime spent adapting to different physical or emotional stresses, your body loses its ability to continue to adapt to more and more things. Allergens in the air and in food are simply another element of the surrounding environment which the body has to adapt to, but in some cases it simply can’t—perhaps because it doesn’t have the capacity to do so anymore. Chiropractors do not treat allergies, but they do focus on making the nervous system function as optimally as possible. Medical professionals in this industry are constantly seeking out new ways to make the nervous system work as best as it possibly can, and that includes its response to potential allergens.